- Important Reminder: Not Support Heart Rate Function. Help you to lead a healthier life, record daily activities, track exercise, count steps, distance, calorie burnt, and reach your fitness and health goals. 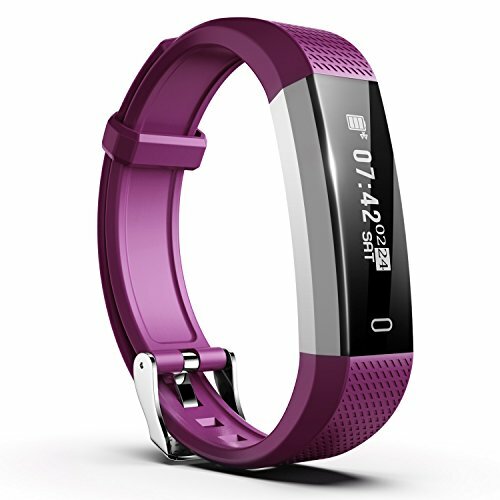 - Multiple Features and Waterproof: Track steps, calories, distance, sleep quality monitor, call and message reminder, alarm and sedentary alert. The IPX7 waterproof level allow you to use in rain, shower and resists daily splash. - Compatible with iOS & Android: Download"DayDay Band"App on your smartphone. App supports iPhone, Samsung, LG, Google Pixel and more, requires Bluetooth 4.0 or above, iOS 8, Android 4.4 or above. - Super Easy USB Charge: Full charge in less than 2.5 hours, Standby up to 7 days. No need charging cable, built-in USB allows you charge on laptop, desktop or power bank, charge wherever USB port is available. - Warranty and Support: 12 months replacement warranty and life-time technical support, offer customer 7*24 online stand by, 100% money back guarantee.